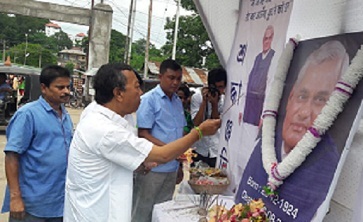 The East Karbi Anglong district committee of the Bharatiya Janata Party (BJP) organised a ‘shraddhanjali’ ceremony for the former Prime Minister of India Atal Bihari Vajpayee at the Diphu Railway Station on Wednesday morning. The programme was attended by the district party chief Ratan Teron who is also the Executive Member of the Karbi Anglong Autonomous Council (KAAC) along with the General Secretary Ajit Dey and other party leaders and workers. An organisational meeting was also organised by the BJP at Diphu Club for BJP booth presidents and general secretaries under the Lumbajong Block Mandal Committee and BJP Diphu Town Committee. The meeting was attended by the Hill Areas Development (HAD) minister Sum Ronghang, Chief Executive Member, Karbi Anglong Autonomous Council (KAAC), Tuliram Ronghang, president, Diphu Town Committee, Dhiren Tokbi and general secretary Amit Kemprai, president, Lumbajong Block Mandal Committee, Rajesh Hanse, General Secretary, Rupsing Hanse, Executive Member (EM), KAAC, Amar Sing Tisso, Member of Autonomous Council, Ramsing Timung and Mangal Sing Timung and party workers of Lumbajong.